We’d love your help. Let us know what’s wrong with this preview of The Gone Away Place by Christopher Barzak. Ellie heads up her high school yearbook, and until the tornadoes come, her biggest worry is how to raise enough money to print them. But since the day when a rash of powe From Stonewall Honor author Christopher Barzak comes a haunting novel of love and loss, in which a series of tornadoes rips through a small midwest town, forever altering the lives of those who live there. To ask other readers questions about The Gone Away Place, please sign up. Oh my goodness, that was gorgeous. These are the words of the therapist of Ellie Frame, tornado survivor, in the book The Gone Away Place by Christopher Barzak. Ellie lives in the small Ohio town of Newfoundland that was half destroyed by an “outbreak” of tornadoes. The morning of the outbreak, Ellie got in an argument with her boyfriend, Noah, and was so mad and slightly over dramatic that she ditched school to go brood in a lighthouse (Yes, there’s a lighthouse in the middle of tornado territory. Long story.). She dozes off and later awakes to witness her town’s devastation and a gas tank explosion at her school from her safe little hill. All of her closest friends are killed along with hundreds of other victims and… Noah. The boyfriend. Ouch. At this point, you’re probably predicting, as I did after Noah’s death, that the whole book will be about Ellie mourning her high school boyfriend and fulfilling adults’ stereotypes of teenage drama. If you think this, you’re wrong! Well, okay, you’re sort-of right. But Ellie isn’t that pathetic. Her levels of grieving are perfectly reasonable, and the story goes beyond the main character’s struggles. Another thing: if you think this book is realistic fiction, you’re wrong! Now that you, dearest reader, know the premise and are sufficiently hooked, I’ll get down to the good stuff. As you may have noticed in my opening quote, the author uses beautiful, symbolic language. I also cannot resist a book that capitalizes “Death”. There’s symbolism everywhere from the characters’ representation to the chapter titles. The Gone Away Place gets you questioning your freaking EXISTENCE. While reading during Journalism, I kind of over analyzed and convinced myself I wasn’t alive unless someone acknowledged my presence in this world. No one talked to me for about twenty minutes (which, thinking back, makes sense since I was reading), so I had a mini existential crisis. It happens all the time; don’t worry. The only big problem I had with this book is the author’s frankly wussy attempt at diversity. One of the ghost friends told the story of her gay brother’s rejection from her Christian family. It was sad and all, but I felt like Barzak was just crossing “queer characters” off his diversity checklist. Same deal with the only character he explicitly mentioned was not white. He went all out with Japanese traditions and symbolism for a chapter or two and then continued with absolutely no racial diversity. Sure, this takes place in a conservative small town, but you can’t just toss in a gay character and a Japanese character for a bit and ignore them the rest of the time. The story could have survived without them, and it could have also benefited from their further involvement. If you don’t mind this lack of diversity and enjoy depressing but exquisite writing, The Gone Away Place is the book for you. The story itself is entertaining, and it also encourages readers to tell their own stories. Several of the ghosts are longing for the future they will not have now. They tell Ellie about their plans - reconnecting with a brother, getting out from a sibling's shadow, beginning college. All of them delayed their own happiness because they knew they would soon be able to begin the lives of which they dreamed but now that opportunity is gone and I could feel the loss in reading their stories. When someone we love dies, all of our future dreams with that person die with them. It's not just the person themselves we are missing, it's the experiences we were going to have with them as well. Regret is such a huge part of grieving. There will always be something you wish you had done differently with a loved one after they've died. For Ellie, her last conversation with Noah is haunting her and, since she has seen several ghosts but not him, she appears to have real evidence that he is holding that against her. Tied in with that is the idea that death puts things into perspective and makes us re-evaluate our priorities. Ellie now sees that her problem with Noah was not a big deal in the big picture. Preserving someone's story is important. Once someone is gone, their story dies with them. Ellie finds that capturing those stories is the key to helping a ghost move on. Even her best friends tell her parts of their lives Ellie didn't know about. Remembering someone's story - things they did and what they thought - is their legacy so capture those memories while you can. And on the theme of personal stories... Ellie's counselor talks about the disruption in Ellie's story and how she needs to find a way to continue it, possibly in a new direction. That was such a great visual for how your life begins to mend itself after a death that I stopped to let it sink in and then, to see if I could analyze what changes I'd made in the direction of my life. How often does a book cause me to stop reading and just let its message settle into me? Powerful! Finally, there is hope. Ellie is given such a gift in that she has the chance to talk to her friends again before they move on. I haven't had that kind of encounter with a dead loved one, but I can still identify with the feeling of hope those meetings in the book gave me. Because as bad as grieving is, there are also so many moments when you see something or hear a piece of music or remember something about that person that makes you smile and makes your heart fill with love and happiness that you had that person in your life in the first place. Ellie talking with her friends brought those warm feelings to me while reading the book and it felt completely at home as a part of the grief. 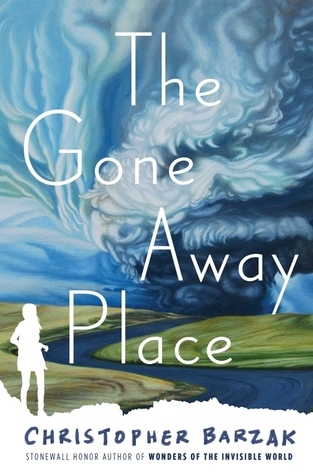 The Gone Away Place is a deep story that presents itself almost as an adventure or horror novel - tornadoes! angry ghosts! Take time to read it and really experience the full range of what it has to offer. Also - holy crap, is that cover terrifyingly beautiful! Even though it's not a long book it took me about two months to finish this, because I had to read it in short bursts--partially because Christopher Barzak's writing is so hauntingly beautiful that I wanted to take time to process it, and partially because the entire book was an emotional sucker punch to the gut. I don't think I've ever read another book quite like this, especially not one aimed at teens, but I think I'll remember Ellie and her friends for a very very long time. A story of tragedy and grief, and how we use that as fuel to pick up the pieces. Bravo, Chris. I’ve read much of Christopher’s work, and I’m always taken by how the tone matches the story. The tender pace here keeps readers where they need to be as they navigate Ellie’s deeply changed world with her. The afterword struck me especially because when the 1985 tornadoes hit, I was dating (briefly) a cute guy who would go on to be a lifelong, dear friend. His uncle’s home had been destroyed in the outbreak, and my friend and his family spent the summer rebuilding it. My friend died suddenly ea I’ve read much of Christopher’s work, and I’m always taken by how the tone matches the story. The tender pace here keeps readers where they need to be as they navigate Ellie’s deeply changed world with her. The afterword struck me especially because when the 1985 tornadoes hit, I was dating (briefly) a cute guy who would go on to be a lifelong, dear friend. His uncle’s home had been destroyed in the outbreak, and my friend and his family spent the summer rebuilding it. My friend died suddenly earlier this year, and this book lifted the veil and reminded me of how young and wide-eyed we were back then. I wasn't expecting this book to be one that struck close to home (figuratively and literally). I grew up where these tornados hit, but I wasn't living here at the time, but came to visit after and saw the devastation. Barzak did more than make this about an incident in his childhood, I think he managed to make it a story that rings true for any and all disasters that can affect one or many people. This story could be read by the the victims of all the mass shootings, the earthquakes, the floods, I wasn't expecting this book to be one that struck close to home (figuratively and literally). I grew up where these tornados hit, but I wasn't living here at the time, but came to visit after and saw the devastation. Barzak did more than make this about an incident in his childhood, I think he managed to make it a story that rings true for any and all disasters that can affect one or many people. This story could be read by the the victims of all the mass shootings, the earthquakes, the floods, the wars, anyone who lost a family member, a friend, neighbors, homes, schools, teachers, children. Barzak manages to touch on both the sadness and the hopefulness that is a part of being in this world. Fictional story about a major tornado that comes through an Ohio area and the tragic events that happened to a group of high school students. Most of the students have died, but Ellie is alive. It’s a hauntingly eerie fictional story that will leave you anxious to turn the page. A moving, heartfelt examination of community grief in the wake of mass tragedy, AKA a character study of America in 2018. Following a fight with her boyfriend, Ellie dips out of school and retreats to the lighthouse to brood. She falls asleep thinking of the time they share there together, and the other girl her boyfriend has been spending an uncomfortable amount of time with, threatening an end to those quiet moments. Ellie awakes to a great storm, and exits to witness an outbreak of tornadoes that essentially level the town. The school is destroyed, taking the lives of her best friends, her boyfriend, and the girl Following a fight with her boyfriend, Ellie dips out of school and retreats to the lighthouse to brood. She falls asleep thinking of the time they share there together, and the other girl her boyfriend has been spending an uncomfortable amount of time with, threatening an end to those quiet moments. Ellie awakes to a great storm, and exits to witness an outbreak of tornadoes that essentially level the town. The school is destroyed, taking the lives of her best friends, her boyfriend, and the girl she felt so threatened by. Later, people in town begin to sight ghosts roaming the town. Before the outbreak, Ellie occupied her time with capturing the true spirit of her friends in candid shots when they didn't know a camera was there. After the outbreak, she finds that the only way to free their souls is to draw the same candor out of them in a recording of what she calls, "their last will and testament." Their stories, told without fear of rejection or judgment. The moments Ellie previously captured in a camera, formed into the spoken word. The Gone Away Place is a raw and honest examination of grief and regret in the light of tragedy. The characters who survived struggle to make sense of what's happened and the ghosts they're seeing. Ellie battles with regret over the last fight she had with her boyfriend, and relief that having that fight is what saved her life. The ghosts must come to terms with their dreams unrealized, hopes and wishes they'd set aside for later that will never come to fruition, and severed relationships that can never be mended. This book had a "6th Sense" or Dean Koontz feel. I would actually give it 4.5 stars if I could. The only thing I thought it lacked was a little more intensity in the climax. In the story, Ellie survives a devastating tornado that takes the life of her boyfriend and best friends. The author's description of the events that caused the tragedy were vivid and intense. The main character's reactions to the tragedy were well-thought out. I liked it, and it is a good exploration of grief and loss. I recently finished reading George Saunders' Lincoln in the Bardo, and this book was an interesting companion to it. The ideas of the spirits of dead people hanging around and that place being unsafe were in both novels, which is so interesting to me. New YA Fiction. Inspired by real events with a touch of the supernatural added. Relevant and powerful, a moving examination of the path forward when faced with unimaginable loss. It will speak to today's teens. Despite the theme of this novel, the first thing that comes to my mind to qualify it is "down to earth". Chris has a way to write characters, making them so real and so not cliché, that never ceases to amaze me. The story itself was rather hard to read for me due to the main themes of loss and grieving, but in the end, it is such a lovely and hopeful story to read. I clearly recommend reading it! Ellie and her boyfriend, Noah, have a fight one morning before school so instead of heading inside, she huffs off and drives across town to sulk in a nearby lighthouse. That's when the tornadoes come... In the wake of the "outbreak"; nearly 100 people in a town of barely 2,000 in Ohio are dead; the area is declared a disaster zone, and Ellie had watched in stunned disbelief from her vantage point in the lighthouse as her high school exploded. This is the story of a town trying to cope with the m Ellie and her boyfriend, Noah, have a fight one morning before school so instead of heading inside, she huffs off and drives across town to sulk in a nearby lighthouse. That's when the tornadoes come... In the wake of the "outbreak"; nearly 100 people in a town of barely 2,000 in Ohio are dead; the area is declared a disaster zone, and Ellie had watched in stunned disbelief from her vantage point in the lighthouse as her high school exploded. This is the story of a town trying to cope with the massive loss and grief after such a ravaging disaster. Ellie lost her 3 best friends as well as her boyfriend. Yet, a few days after the outbreak; she realizes that her next door neighbor's son, who she keeps seeing on the back deck listening to his music, was also killed during the storms. Largely a story about navigating life after huge loss; this also becomes a bit of a ghost story as Ellie realizes she is seeing the ghosts of many who died during the outbreak and that she is able to help them cross to the other side. A lot of good writing, some nods to diversity with a brother of a friend who is gay and a Japanese American friend, and a hint of spooky ghost action. Anything you didn’t like about it? While it seemed in the last third of the story that things were going to get very spooky and dark; it all fizzled away a bit unsatisfactorily with a very weak and rather boring climax so if you go into that build-up expecting something a bit more dire and interesting to happen you'll be disappointed; this is all about one girl (one town) processing her grief. First off, I want to say that the premise of this book is very good: a small town recovering after a natural disaster that destroyed buildings and took lives. Having lived with tornadoes for years and living through hurricanes more recently, I can understand the feeling of coming out of it and seeing how much has been lost. I like what this book was doing in showing the grieving process. I like how it could vary by individual and culture, and the rules on who saw the ghosts and how they moved aro First off, I want to say that the premise of this book is very good: a small town recovering after a natural disaster that destroyed buildings and took lives. Having lived with tornadoes for years and living through hurricanes more recently, I can understand the feeling of coming out of it and seeing how much has been lost. I like what this book was doing in showing the grieving process. I like how it could vary by individual and culture, and the rules on who saw the ghosts and how they moved around was pretty good. The main character could be pretty oblivious at times, though. I think her worst offense was talking to a grieving mother about seeing her daughter because she was the only link to the MC's boyfriend. But I have to say that the possession parts were downright terrifying. But that actually brings me to the weaknesses of the book. I don't feel like it pushed quite hard enough on some stuff. Like, why aren't more people being possessed, for example? And how are the other ghosts moving on, or are they? Why is Ellie's method for helping the ghosts working in all the cases she comes across? The possession thing was also solved way too quickly and the animosity between the MC and another character was also cleaned up too neatly. I also get why the MC worked with those specific ghosts, but it would've been interesting to see some others around as well. The tornadoes killed half of Ellie's senior class including her 3 best friends and her boyfriend. Ellie has to learn how to keep living through her grief. She sees their ghosts and gets to say goodbye while helping them record their final testaments before they move on. Noah appears to her last because he doesn't want her dwelling on the deaths or feeling guilty for not being there when they died. Not what I expected when I read the synopsis, in a good way. Also it got better the further in I got. But. I don't know. It feels fragmented with all the disconnected stories. Still. Bits of it is really good. I really did feel with so many of the side story people. Just maybe not so much with the main character. Wonderfully written and full of emotion, but something just kept me from LOVING it, and I can't decide what it is. Still, I'm glad I picked it up. Please see my review on Amazon.com under C. Wong. Thank you. Didn’t enjoy this book as much as his last book Wonders of the invisible world which I really loved but still a nice book about loss and grieving. This is my first experience with this author, and I'll admit to having some high hopes after reading the premise. A small Ohio town is left devastated in the wake of an outbreak of tornadoes. The main character, a senior in high school, Ellie Frame, is lucky to have not been with her friends on that fateful day. A fight with her boyfriend drives her to cut class and hide away, leaving her as the only one left alive. Wracked with grief and survivor's guilt, Ellie is not alone in seeing those who This is my first experience with this author, and I'll admit to having some high hopes after reading the premise. A small Ohio town is left devastated in the wake of an outbreak of tornadoes. The main character, a senior in high school, Ellie Frame, is lucky to have not been with her friends on that fateful day. A fight with her boyfriend drives her to cut class and hide away, leaving her as the only one left alive. Wracked with grief and survivor's guilt, Ellie is not alone in seeing those who have passed - the narrative offers other first-person accounts and includes the stories of the deceased as well to give the story of the whole town, really. Unfortunately, I never felt connected to any of the characters. Ellie's main purpose, as a sort of passive witness, makes it hard to really relate to her... and her relationships with her friends and family are not very dynamic or convincingly real. Plus, it seems odd that even her own parents define her by her relationship with her boyfriend... It doesn't feel like a very authentic high school story and none of the conflicts that are introduced between any of the other children and their parents is ever resolved. The afterword that explains the inspiration for the book is actually the most interesting part of the whole book (a real 1985 outbreak of tornadoes mixed with the outbreak of ghost sightings following the 2011 tsunami). Maybe if the book had a stronger narrator, with a more developed personality, this would have been a stronger book.